What's better than victory Skittles? To the victors, go the spoils. The Cardinals did something that no team has done in Seattle since late 2011: hand the Seahawks a loss, 17-10. A lion’s share of the credit for the upset goes to Arizona’s defense, which did a great job of bottling up stud running back Marshawn Lynch. So, what did the Cardinals D do to celebrate? 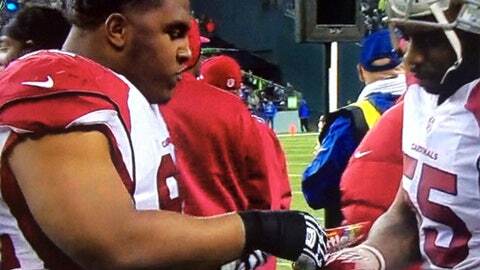 How about mimicking Lynch’s tradition of chomping on Skittles? Enjoy guys, you earned it.